I was reading Candace Spigelman's Personally Speaking: Experience as Evidence in Academic Discourse where in chapter three she talks about the construction of one's experiences in narrative writing. She argues that we, the storytelling humans (as Walter Fisher argues on the Narrative Paradigm), cannot capture the "real and actual" events in our lives based on contemporary theory (62). What we can do is "reconstruct" this memory, to experience these events into text and not the truth (63). I wrote my Technology Narrative paper before I read Spigelman's book so when I was reading the book I agreed on this argument, and the chapter on "Constructing Experience". As I mentioned in part two of this Technology Narrative series, I remembered bits and pieces of my childhood stories due to pictures or remnants of memories in my brain. I don't remember all my childhood memories, and if given the chance I would like to go back to see how I lived as a child, but not change anything. But let's not talk about it here, because my early experiences with technology is only a part of my childhood. I talked about the first technological tools I used, the pen and paper, in the second part of the series. This series is actually a four-part narrative series, the third part about the technological devices from my childhood at home, and the last part would be my technological narrative in school (from grade school up to high school.). Remember, I was born in the Philippines. I grew up in the Philippines. So the young me in the story is someone who grew up in the Philippines who had no idea (then) that she was migrating to another country (and culture). My parents taught us to not have everything we wanted. This taught me to value what I have, to not waste it, and to not fix something that is not broken. Despite not having everything I wanted as a child, looking back, I am glad that my mother did not buy me all the toys in the toy store. Instead, she bought books. Sure, we had toys, but not a lot. And I was fine with that. I was a happy kid growing up in the 90s. As I mentioned in my technology narrative paper, music is a significant influence to my life so it was no wonder that we have a music system at home. My mom told me we used to have a record player because my dad had his vinyl records kept. So growing up, I used any musical technological device. There was a tape player in the van too whenever we go on road trips and long drives. When relatives visit, the adults watched concerts (on VHS tapes) while the children played outside. On Sundays when there were no classes and it was cleaning day, my mom would turn on the radio. I remember during second grade where I used to watch Disney films on our VHS player after I got home from school in the afternoon. I first asked my mom how to set it up and when I learned how to do it myself, I watched films by myself because I didn't want to interrupt my parents who were busy with work (we had a home-based business). So at the age of 8 I was able to watch films by myself. I didn't just watch films or listen to music when I was growing up though. My two older brothers played the Family computer a lot while I watched them. I didn't play a lot; one, I had to fight over my two brothers, and two, I wasn't really interested. I preferred watching them play even though I could finish one stage of Super Mario or Battle City. My brother also played the GameBoy, and as usual, I would only watch him. If I did use the GameBoy, I think it was only for easier games. Whenever we visit my cousins, I would also watch them play Resident Evil on the PlayStation. Nokia 1011 - quite close to the first cell phone we had and this looks much worse. Nokia 3210 - a better phone than the 5110 but worse than 3310. 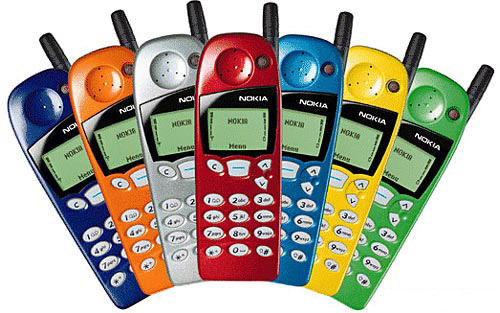 Nokia 5110 with its interchangeable covers. I never really liked this phone; I don't know why. Nokia 3310 released in 2000. Our household had a fair amount of communication devices that I used as a child. Because we had a home-based business, a telephone was necessary. I think it was in the mid to late 90s that I was introduced to cell phones. The first cell phone I held on my hands was a Nokia phone. It was a huge and heavy phone, but based on the time it was released, it was perfect. I'm not sure what the model name was, but the phone looked like Nokia 1011 but aesthetically better. There were other cell phone brands that emerged in the late 90s. Motorola, Sony Ericsson, and Philips were some of the brands, but Nokia was more popular. The Nokia 5110 and 3210 were the classic Nokia phones that were really popular before 2000. But after the clock stroke a new millenium, there was another popular cell phone that emerged: the Nokia 3310. This was the most popular and widely-used by most Filipinos; everywhere you go, almost everyone used this phone. I started high school in 2001, and a few of my classmates had cell phones better than the 3310. The Nokia 3310 was just a basic cell phone: it has a call and text message feature but it had better games and ring tones than 5110 and 3210. But after the 3310, everything changed. Again. By the time I was in my third year in high school (equivalent to Grade 11 in Canada), most cell phones had these features: camera, video, built-in music player, polyphonic and monophonic ring tones, coloured wallpapers, and different sizes and shapes of phones. By fourth year, everyone in class had cell phones. Cell phones became a regular accessory because everyone had it. I was so used to seeing cell phones when I was 15 years old so sometimes I'm not fascinated with cell phones anymore unless these phones are made in Japan or South Korea. I've always thought that North America is still far behind the technologies in Japan and South Korea. Especially Japan. I maybe biased because I've always wanted to go to Japan. Or maybe because I grew up in a place where technology seemed to change as soon as I get used to one device. Take the BlackBerry and iPhone, for example. I'm not excited to own these cell phones, and I don't see myself buying one soon. First, because I don't need it. Second, I'm not interested. And alright, the third reason is that I don't have a budget for an iPhone plan that's more expensive than my monthly bus pass. Seriously, I don't see myself owning an iPhone in the near future. I know that I will eventually use a Smartphone, but not an iPhone. Even though I don't buy the latest cell phone in the market, I keep myself updated. And right now, the phone that I really like is the Samsung Galaxy SII or the Sony Ericsson Xperia. And yes, I just said that I prefer Asian-brand cell phones. Although I don't mind a Nokia phone in the future which depends on circumstances. Spigelman, Candace. Personally Speaking: Experience as Evidence in Academic Discourse. Carbondale: Southern Illinois UP, 2004. Print. If you want to see the old Nokia cell phone models, here's a link: GSM Arena Nokia cell phones. On page 6, I can count in my fingers the number of cell phones that I had never seen before I graduated from high school. So this gives you an idea that I was a witness (sort of) of the cell phone history (or timeline) and why I'm not too interested in getting a Smartphone right now. You could look at page 5, and again, I've seen most of these phones before I turned 16.